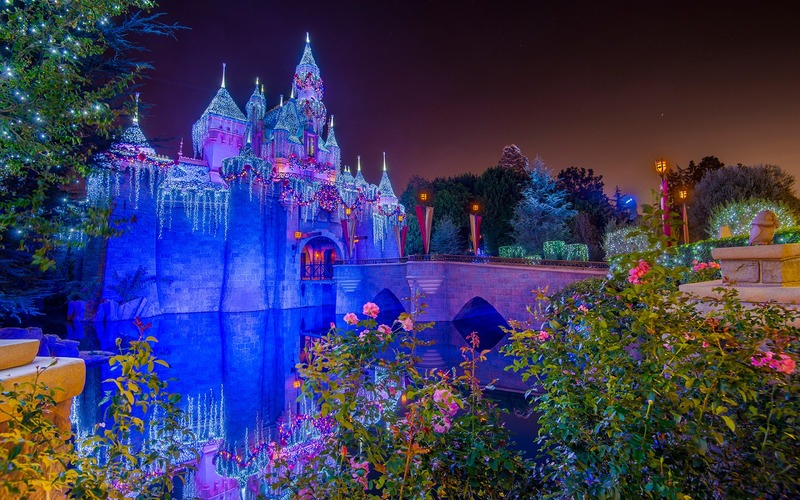 The winter castle at Disneyland is a beacon of joy and majesty and the spirit of the Christmas season, and its glowing presence reinforces the beauty of the holidays. With its icicle lights and diamond tipped spires, it conveys a lavish facade, but one that brims with nostalgia and charm and radiance. It's a symbol of the yuletide light, and it never fails to make a cozy impression. No matter what the angle, the castle always looks grand and glorious! Luminous Sleeping Beauty Winter Castle and a partial reflection.